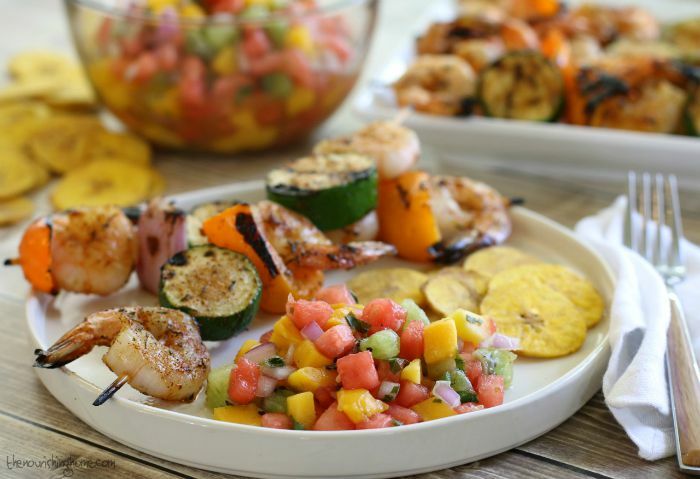 Hold the tomatoes … this summertime salsa is simply sensational! September is peak season for watermelons here in Sunny California, and in most places across the U.S. too! And as much as we love a cold, juicy slice of melon on a hot summer day, there are so many other delightful ways to enjoy this refreshing summertime fruit, like this super easy and flavorful Watermelon Salsa! Wait! Hold the chips! If you’re doing Whole30, you’ll need to forgo the honey (as noted in the recipe) and those chips too! Remember, packaged plantain chips are NOT Whole30 compliant (sorry)! The good news is, this sweet-n-savory watermelon salsa goes beyond an appetizer … it also makes a delicious accompaniment to salads, seafood and poultry dishes, like my Grilled Cilantro Lime Chicken. So pile it on to your favorite Whole30 dishes and enjoy! Yum! P.S. Watermelon isn’t just refreshing, it’s nutritious too! High in vitamins C and A, this summertime favorite helps boost your immune system. And it’s also loaded with lycopene, one of the most powerful antioxidants noted for lowering the risk for cancer and cardiovascular disease. • A creamy yellow spot … this means the melon was allowed to rest on the ground and fully ripen before being harvested. • Heavier than it looks … the heavier the melon, the juicer the slices. Compare a few melons of similar size, and chose the one that’s the heaviest. • Uniform in shape … it’s not how round the melon is that count, but whether the shape is symmetrical. An irregular shaped melon usually indicates poor growing conditions, which results in less flavor. Even More Delicious Ways to Enjoy Watermelon! 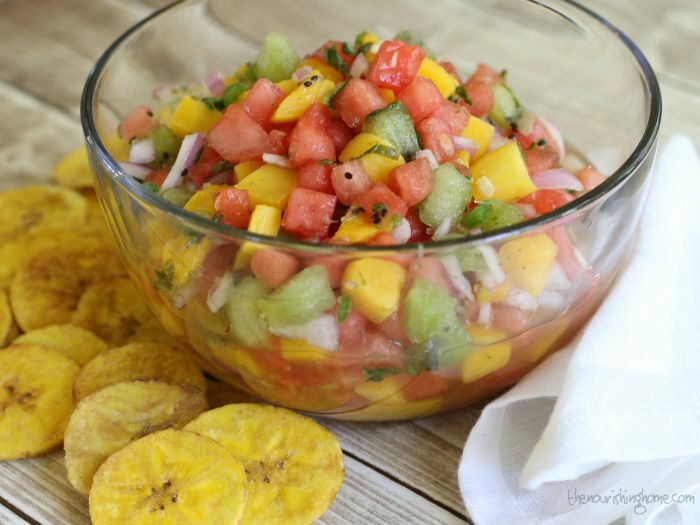 • Sensational Salad … Use cubed watermelon in place of tomatoes for a delightful and refreshing summer salad. • Refreshing Melon-ade Pops … place chunks of watermelon in popsicle molds and then fill with fresh-squeezed lemonade. Freeze solid and serve to smiling faces. 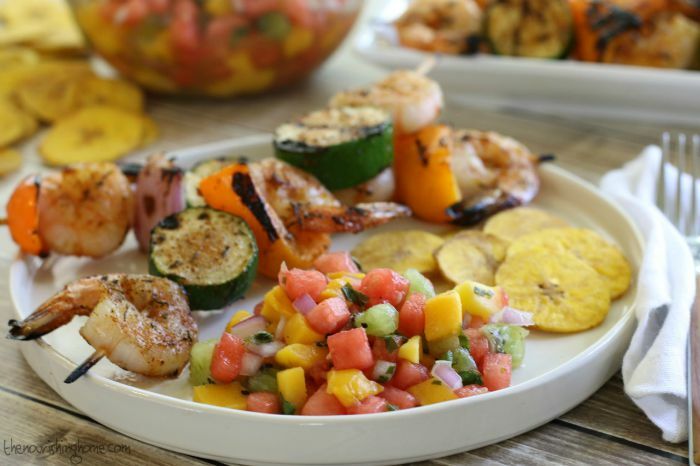 • Fire Up the Grill … Lightly brush thick-sliced melon with olive oil and sear on a hot grill for 3-5 minutes. Then sprinkle with sea salt and pepper. Or cut the melon into large cubes and add to skewers with chunks of mango and pineapple. Lightly brush with oil. 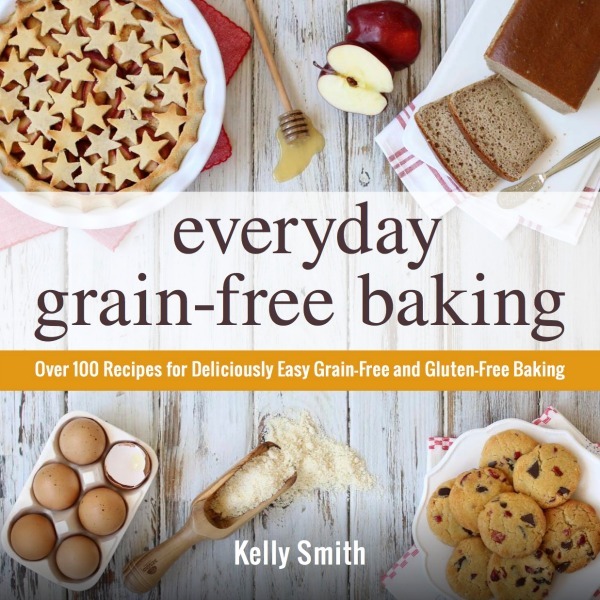 Then, grill and serve as a side dish at your favorite barbecue. In a medium bowl, add the fine-diced watermelon, mango, kiwi, onion and jalapeño. Sprinkle top with minced herbs, lime zest and salt. Drizzle in lime juice and honey (omit honey for Whole30). Gently fold the ingredients together until combined. 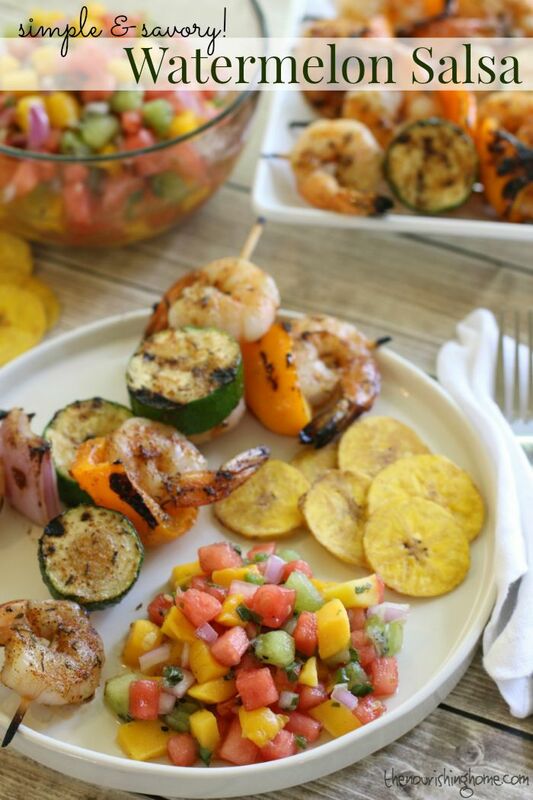 Makes a wonderful condiment to top grilled meats and seafood like our favorite Grilled Shrimp Skewers.